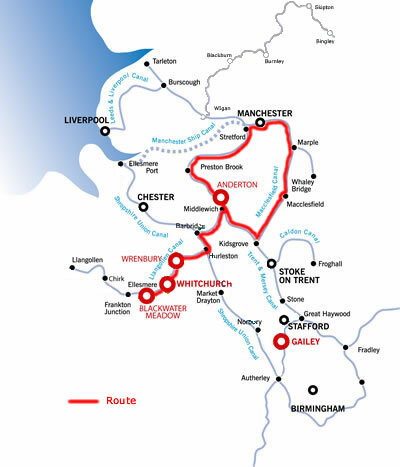 The Cheshire Ring takes in the whole of the Macclesfield Canal and parts of the Trent and Mersey, Bridgewater, Rochdale, Ashton and Peak Forest Canals. It provides a complete range of canal scenery, including the upland vistas of the Macclesfield Canal as it skirts the edge of the Pennines, the gentle rolling Cheshire countryside, industrial areas and the lively city centre canalscape of Manchester. It has a variety of canal features including broad and narrow locks, aqueducts and tunnels. It also passes the historic Anderton Boat Lift near Northwich. locks, aqueducts and tunnels. It also passes the historic Anderton Boat Lift near Northwich. From Wrenbury marina turn east you will soon encounter your first Lift bridge, if it is down you need to get your windlass out and let someone off the boat to open it up. There are 3 locks at Baddiley but apart from that the countryside is flat, rich farmland. You can moor up after a couple of hours cruising by Halls lane bridge 12, and take the track to Ravensmoor where you will find the Farmers Arms serving real ale & meals. There are 2 locks at Swanley but no more until you reach the end of the Llangollen canal at Hurleston, where there are 4 in quick succession. Hurleston reservoir is off to the left. Turn left at Hurleston junction onto the Shropshire Union Canal, you will follow the reservoir for a short while. At Barbridge you reach the junction of the Middlewich branch of the Shropshire Union, so turn right here There is a bar & grill at Barbridge. This canal is an attractive and under rated canal with some wonderfully tranquil moorings. There are no villages and no pubs until you reach the town of Middlewich with only 3 locks along the way until you reach the Middlewich junction where the Wardle Lock takes you onto the Trent & Mersey canal. The canalside area of Middlewich is a haven of peace below the busy streets. The town has been extracting salt since Roman times. Turn right & cruise south down the Trent & Mersey Canal past several salt works, which shows this areas industrial heritage. The Rock salt mining that has gone on since Roman times has resulted in severe local subsidence, and the canal has had to be banked up in some stretches, which makes it much deeper than normal. There is a chinese takeaway west of bridge 166. Occasional locks mark a quiet and unspoilt area, the town of Sandback is away to the left, as the canal reaches the village of Wheelock. This busy little village has a stores and fish & chip shop., and 3 pubs, 2 near bridge 154, and one Canalside- the Cheshire Cheese- with moorings outside. Sandbach is 1 ½ miles north of Wheelock, and is an old market town that has retained its charm. In its old cobbled market place stand 2 superb Saxon crosses, there are 7 pubs to choose from around here. After Wheelock the first of 26 locks called Heartbreak Hill will have to be negotiated before you get to Kidsgrove and the junction with the Macclesfield Canal, but for this days cruising you will only have to do 14 before mooring up for the night in the village of Rode Heath. First pass the village of Hassall Green, the village has a stores and a canal shop within the canal Centre, which also houses a cafe beside the canal, there is lockside seating. You then negotiate 5 locks and pass the village of Rode Heath to your left, there is a canalside pub here and it has a useful shopping area, it is 8 hours cruising to here so you can stop for the night. When you reach Rode Heath you have covered 10 miles today, and done 21 locks, and cruised for 8 hours. Your crew will now be busy as the next few locks appear, as you approach the very unusual junction with the Macclesfield Canal. You have to go under the Macclesfield Canal, through locks 43 and 42, and cruise on through lock 41 to the Hardings Wood Junction, then turn right on the Macclesfield Canal to go back on yourself & cruise parallel to the Trent & Mersey canal in the same direction you have just come from, to then turn right over an aqueduct to cross the Trent & Mersey canal again, so you have come full circle! There are various pubs to quench your thirst, The Red Bull Hotel by lock 43, The Canal Tavern by bridge 133, and the Blue Bell canalside at Hardings Wood Junction. It is a very busy interesting canal area, and as you leave it you enter glorious open countryside . The Macclesfield Canal is very shallow so only moor at designated sites. Scholar Green, and another near bridge 87 at the far end of the village. You can walk to the top of Mop Cop east from bridge 85. It is a hill nearly 1100 ft above sea level, which gives you a magnificent view across the Cheshire Plain, beyond Stoke and into Wales. At the top is Mop Cop Castle which is an imitation ruin built in 1754. The canal loses itself in splendid countryside for several miles, to the east beyond the hills is the Pennine Chain. ¾ mile west of the canal by footpath from bridge 86 is Little Moreton Hall, a national trust property. This fabulous moated house is one of the best examples of black and white timbered architecture in the UK, and is well worth the walk. It has hardly changed from when it was built in around 1559. 1 mile north of bridges 79 & 80 is the pretty village of Astbury, and Astbury garden centre is just along the road from the vllage. 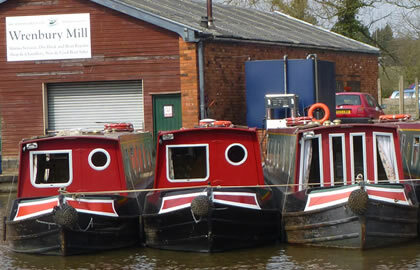 The canal passes through the compact and busy town of Congleton, there are useful shops near bridge 75. If there are any cyclists amongst the crew, there is a 20 mile cycle ride suitable for families around Congleton which take you past Marton Church, the oldest half timbered name in Europe, and Cheshires oldest oak tree which is over 600 years old. East of bridge 71 is the fell called the Cloud, over 1000 ft high and with the remains of ancient earthworks on top. There is a good walk to the top from here. You can moor up near bridge 61- Congleton bridge, there is a pub & restaurant – the Robin Hood south of the bridge . You have covered 12 miles today and done 14 locks, it is just under 8 hours cruising to here. Beyond bridge 57 you reach what effectively are the only locks on all the 27 miles of the Macclesfield Canal. The 12 Bosley locks raise the canal by 118 ft to well over 500ft above sea level in just one mile. The facilities block beside bridge 54 includes a shower, toilet, and a laundry. Approaching Oakgrove, the foothills and mountains of the Pennines, some over 1200 ft high, spill right down to the canal, the route follows open attractive countryside following the contours of the land. The Royal oak Swing bridge is hydraulically operated & you will need your british waterways key to operate it, and just follow the instructions on the bridge. Oakgrove is a delightful place with a superb backcloth of green hills. There is a lovely country pub pub east of bridge 49- the Fools Nook. Sutton Reservoir is close to the bridge just to the north, there are walks and picnic areas. You start to approach the town of Macclesfield, a very wide stretch of water is overlooked by an old flour mill, now some very upmarket apartments. This is the old Hovis Mill built in 1820 and home of the famous flour. The best place to moor for the town is bridge 37, which is also handy for the shops. The town is just down the hill, and is an interesting mix of modern industry and old market town, with cobbled streets and picturesque medieval market place. In the 18th century the town was one of the leading silk producers, and there is a museum and heritage centre, where you can see Jacquard handlooms in action. The tree lined canal continues northwards through open countryside to Bollington, and there is a good view of this stone built town from the huge canal embankment that cuts across it. From here it is only 1 mile to the boundary of the Peak District national park. West of bridge 27 is a sociable village pub. As the canal leaves Bollington it enters an isolated stretch through quiet countryside, there are pubs:- Windmill Inn 250yds west of bridge 25, Miners Arms near bridge 18- there are good moorings here. Also a picnic area of Hag Footbridge 16. The village of Higher Poynton is very picturesque, with lots of geese, ducks & swans, the Boars Head is down the hill from bridge 15. Moor up here for the night. Also from this bridge is a footpath leading to Lyme Park, a magnificent Italianate palace, a national trust property set in 1400 acres of parkland containing deer. Originally a Tudor house it was converted by a venetian architect, but some Elizabethan interiors can be seen. The house featured in the BBC\\\'s production of Price & Prejudice, and has lots to see, including countless works of art. The house is open Fri-Tues 13.00-17.00. To Higher Poynton you have travelled 14 miles, done 12 locks, and taken 8.25 hours. Above Higher Poynton the canal becomes wider, be sure to stick to the main channel. There are useful moorings and supplies at High Lane, the Bulls Head is canalside. There is a useful shop downhill from bridge 6 as you pass hawk Green & Goyt Mill on your way to Marple. At Marple Junction the Macclesfield Canal leaves to the south west, by the attractive buildings of Marple Yard, this busy canal centre is framed by the mountainous country across the Goyt Valley. The canal here is 500 ft above sea level. Turn a sharp left at the junction, onto the Peak Forest canal, the 16 Marple Locks carry the canal down towards Manchester. There are various pubs- The Ring o bells by bridge 2 and the Pineapple Inn just a short walk from there. There is no mooring once you start the Marple Flight, so you cannot stop once you have started. Once through the locks you go over the ancient monument that is the Marple Aqueduct which carries the canal over the River Goyt about 100 feet above the river, alongside is the even bigger railway viaduct. The canal then dives into Hyde Tunnel, just 308 yards long, you pass over 2 small aqueducts near Hatherlow, there are 2 pubs to the east of bridge 14. Romiley, bredbury & Woodley are all passed along this stretch as the canal heads northwards, although the scenery is less rural it is nevertheless still very interesting. The Haughton Dale nature reserve near bridge 9 has walking & cycling through pasture and woodlands. The canal travels under the M67 as you pass Hyde to the East, moor up near bridge 2 Ashton Street bridge, the Globe Hotel is canalside. You can moor anywhere along the approach to Dukinfield Junction, right up to Portland Basin, the towpath is tidy with plenty of grass, trees and seats. You have travelled 11 miles, cruised for just under 8 hours and done 16 locks today to Ashton Street bridge no 2. Your next day will take you through the heart of Manchester, along the Ashton canal, and you need to take the usual precautions as with any built up area- lock any front hatches or doors, and put valuables out of sight. There have been few incidents along the canal, but if cruising during school holidays or weekends, plan to do this stretch earlier in the day as it only takes 3-4 hours to travel the whole length of the canal. Don't be afraid to venture into urban areas where the industrial archaeology can be very interesting. The contrasts along the route are part of what makes the Cheshire Ring so rewarding! Be prepared for a long day of about 12 hours cruising. The Ashton canal takes you past steaming factories, tall chimneys, into Manchester proper! The canal is a welcome escape from the city life, and it continues its tranquil path through the city. Your crew will be busy though as the 1st of 18 locks soon approaches as you drop down the canal to the Dulcie Street Junction. The Fairfield Junction is a picturesque canal scene with traditional canal buildings dating back to the 1800's, giving the area a quiet dignity. By the well cared for Beswick flight of 4 locks is a new stadium giving you a good look at the wonderful 'B of the Bang' sculpture an explosion of spikes designed to commemorate the 2002 Commonwealth Games which were held here. At Paradise Wharf and Piccadilly Village the area has been re-developed into smart flats and canal basins. At the Dulcie Street Junction, the Rochdale canal joins, from its journey to Manchester across the Pennines to the north. Turn left onto the Rochdale Canal where another 9 locks are waiting for you! After this first lock the canal disappears under an 18 storey office building . You will now see tantalising glimpses of Victorian buildings and elaborate railway arches, and the bottom lock is beside the restored Merchants warehouse. The excitingly restored Castlefield Junction is also here and you pass through onto the bridgewater Canal. The canal follows the Manchester Ship Canal which is off to your right. By Pomona Lock is the new Metrolink- the new electric supertram. The Canals route takes you close to the Manchester United Football ground, the new stand towers above the canal, to the south is Old Trafford Cricket ground, home of Lancashire Cricket club, and a test match venue. To the North here is the Imperial War Museum North right beside the Ship Canal at Trafford Wharf, the building in stunning clad in shimmering aluminium, and representing a world shattered by war. Visitors enter through a 55 meter high air shaft giving fine views across the city. At Waters Meeting Junction, turn left onto the main line of the Trent & mersey canal, and cruise towards Sale. Moor up for the night by Sale bridge 33, the area around the town hall has been rebuilt , and a couple of pubs and restaurants along with the Robert Bolt Theatre and the Waterside Arts centre take full advantage of their canal frontage. You can get a tram from here on the Manchester metrolink, it takes 10 minutes to get into the city centre. It is 15 miles and you have done 27 locks since breakfast, and cruised for about 11.5 hours. You are now on the last leg, and start heading south back to Wrenbury marina. You soon leave Sale behind, and enter open countryside again on your journey to Lymm. From bridge 26a in Little Bollington, you can walk for a few minutes intothe village to thelovely named pub the Swan with two Nicks. If you cross over the footbridge near the pub, it will lead to Dunham Massey Hall, once the seat of the Earl of Stamford. It is a beautiful 18th century house, with gardens considered to be the best in the North west. The house itself has a sumptuous interior, and the house is managed by the National Trust, there is a restaurant and shop on site as well. Soon the town of Lymm is reached, the town itself is very pleasant with the streets coming right down to the waters edge, a 17th century cross stands a few yards from the canal in this hilly but attractive town. There are various stores & pubs, and a bank, most of the pubs are by bridge 23. More urbanisation is reached with Grappenhall, Stockton Heath and Lower and Higher Walton all merging into one, the Manchester Ship canal leads a straight course about ¼ mile to the north. A short walk from Thelwall Underbridge will bring you to the Penny Ferry, where for a minimum charge, you can be carried across the Ship Canal. Grappenhall is worth a look, as there is a fine group of buildings on cobbled streets which have survived around the church, and also the village stocks. The Rams Head in Grappenhall is in a conservation village and was where Sherlock Holmes was filmed. There are good services 400 yards north of London Road bridge. Between bridges 13 and 11 at Higher Walton is Walton Hall, 20 acres of gardens and parkland, facilities include a childrens zoo, outdoor games, heritage centre, play area, & cafe. As the M56 passes over the canal, so the Runcorn branch of the canal splits off to your right, and makes its way to Runcorn. It is a dead end, but it makes an interesting diversion, if you want tocruise down the 4 miles, it takes 1.5 hours to reach the end of the canal. The old town is to be found down by the docks, where the elegant curved 1092 single span of the steel road bridge with the railway beside it, leaps over the Ship canal and the Mersey. There are pubs along the route & in the town, to the left by bridge 76, & just past bridge 82 (Grapes Inn), and to the north by bridge 84 and 89 at the end of the canal (Waterloo). Norton priory Museum can be reached north east of bridge 75. There is a supermarket & PO south of bridge 74. Heading southwards on the main Trent & Mersey canal, through Preston brook Tunnel, which is 1239 yards long. This northernmost stretch of the canal is very rural, most of the way the navigation follows the south side of the hills that follow the River Weaver, and as you are 60 ft up you are rewarded with excellent views of this splendid valley, and the occasional large vessels that go up and down the River. Anderton is soon reached, and the amazing and enormous Anderton Boat lift is passed. This was built in 1875 to carry the boats down to the River weaver 50 feet below, and has been restored to full working order. Thousands of sightseers are drawn to it each year . A stunning feat of 19th Century engineering, the lift carries two boats at a time hydraulically, one up and one down between the Trent & Mersey canal and the River Weaver 50 feet below. It is 9 hours cruising to here & you can moor just past bridge 200, there is a pub closeby. From Anderton you head south along the Trent & Mersey canal. Away on your left you will see Marbury Country park which has woodlands carpeted with bluebells in the springtime, or relax under the shade of the lime avenues. Wander along the mere with splendid views over the water to the church at Great Budworth, or explore the arboretum and community orchard. Children will enjoy the play area, close to the picnic area. There are attractive short stay moorings here .. In Northwich, the Old broken Cross Pub is by bridge 184 canalside and has moorings. There is a chemist, grocer & other shops ½ mile past the pub towards Northwich. As the canal heads towards Middlewich you move out into fine open country on a beautiful stretch of canal, often overhung by trees following the delightful valley of the River Dane. As you descend into Middlewich there are 4 locks to be negotiated before you turn off right down the Middlewich branch Canal. The canalside area of Middlewich is a haven of peace below the busy streets. The town has been extracting salt since Roman times, and there is an interesting town trail north of bridge 172. There are various pubs canalside along this stretch. As you go under the bridge on the Middlewich branch you encounter another lock, and after bridge 27 as you head out of town there is another lock- Stanthorne Lock, and then you can relax & enjoy the scenery in the next lock free section of the canal. This attractive & often under rated canal provides some wonderfully tranquil rural moorings. This is a quiet section of the canal, passing through rich farmland interspersed with woods. There are no towns and only one small village, so no pubs I am afraid . At the Junction of the Shropshire Union Canal at Barbridge you'll find the Jolly Tar pub or the Olde Barbridge Inn in canalside with moorings. It is 9.5 hours to here from Anderton. After turning left at Barbridge Junction, you soon turn right at Hurleston junction up the Llangollen Canal & you are immediately confronted by the set of 4 Hurleston Locks. It is 4.5 hours back to Wrenbury, so time to slow down and take in the scenery!